To answer the question right away: Yes, Google’s Adwords are definitively worth a try. And even more: Google Adwords belongs to a healthy marketing mix for independent vacation rental owners or managers. Google is the most advanced and most used search engine. Beside the so called “organic” results from internet based search, Google provides Adwords as advertising system in which advertisers bid on certain keywords in order for their clickable ads to appear above or beside Google’s search results. The advertiser is paying by click of users to his ads. Meanwhile the google search is getting mobile (and became a sort of being “insane”), the amount of organic search results in “first view” screen is decreasing and the amount of Adwords ads is increasing. Getting benefit from Googles Users means more and more to pay for clicks – even when you are doing well in SEO. Google Adwords is for sure the marketing industry’s most powerful tool and it is accessible for everybody. There is an easy setup and even the smallest business owners advertising can show up within a view minutes. It can generate business for you – if you understand what you are doing. 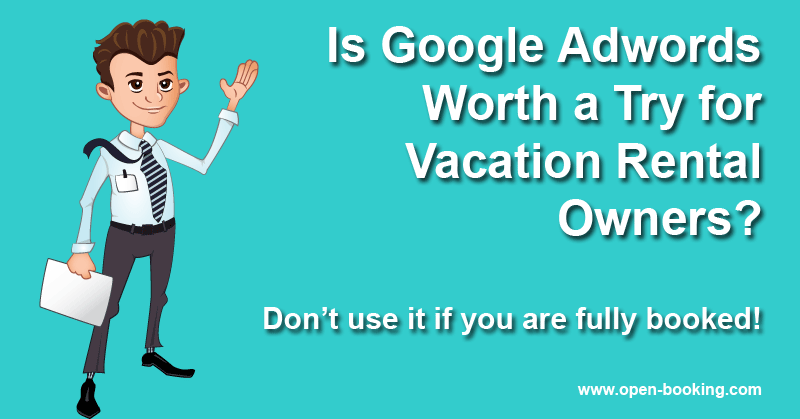 To tell “It’s the marketing industry’s most powerful tool” does not mean that Google Adwords is suitable for your vacation rental business. You are advertising where user are looking for your service. Google is the main entry point of searches for your business. Even better then with SEO, where google decides what result will be shown, you define the message for your future renters in the ads. You’ll reach potential renters you cannot reach with other marketing channels. Keep in mind: the behavior in web-surfing is different from person to person. Like on the listing sites: Some user will check only the first three or five listings for his google search and will have made already his decision after that – even before reaching your website in the organic search results or your listing on a listing-site. You are able to react flexible and fast and adjust your offer to special events, special packages or sudden vacancies – and see the result within a short time. You can close the gap to your competitors who is already using Adwords or even get ahead of them, if they do not do. As your domains name will be shown in any advertising, Adwords will help you branding your vacation rental business even if the ad is not clicked. Opened or not – your ads on google will show up as a trust signal for a professional business. How expensive are Google Adwords? No doubts, advertising your vacation rental business with google Adwords has its price. You are bidding for a position for your advertising for single search requests of users. If Adwords will be an expensive experiment or the cheapest way to fill your vacation rentals booking calendar depends on the way you use it. The price per click will be calculated from the chosen keywords, the bids of your competitors, your “quality score” and several additional factors and will differ from a few Cents up to several Dollars. With a bit of time and experience, you will be able to reduce the high prices for “beginners” within some weeks. No conversion means no ROI – so working with google Adwords should always be working with your own website. We all know that a user is not a renter for your vacation rental. Getting the perfect matching visitors for your offer will raise your conversion. Optimizing your websites conversion rate at all – with better usability, call to actions and other elements – will benefit not only Adwords. Avoiding some simple beginner’s traps will protect you from “just sponsoring Google”. If you have no own website don’t use Adwords. It might look nice to support your listing sites record with Adwords – but better use the time and money to build up your own website and take a step to your independency. Make your websites fit for competition. Before leading payed traffic from Adwords (or elsewhere) to your website, be sure, that your website is able to convert this traffic. While Google Adwords will bring the customers, your website will make them booking. Do you have clear call to actions? Maybe create even special landing page. Switch off the “Content Network”, use only “exact match” keywords – and never “broad match” ones. Get familiar with negative keywords quickly. Don’t set your bids too high or too low – and give them a daily budget, that will not hurt you, if something goes wrong. Spend some time in training, it will pay off fast: Read all about the “Adwords Quality Score” and the different options for selection of the correct target group for your business. Do not expect your Adwords to run on their own forever with perfect result without being maintained. Treat your account like a growing business and take care about. If done well, your Google Adwords campaigns will outperform all your listing-sites in case of bookings and price per booking for your vacation rentals. And even if not outperforming – it will give you additional access to customers for your vacation rental business. Open-Booking will help you out, whenever it is required: Post your questions and experience or ask our online team in chat for help. If you like to have the benefits of an additional marketing channel “Google Adwords” without doing it by yourself, our specialists will manage your account. Just ask for a quote.